After rapidly gaining a loyal internet following over the past few years under the alias Palace, Deejay Astral moved forward with a slightly deeper sound. He arrived on the scene under this new name with a string of releases and remixes on DJ Haus / Unknown To The Unknown Imprint, also recently appearing on W&O Street Tracks with his self-titled ‘Deejay Astral’ offering. 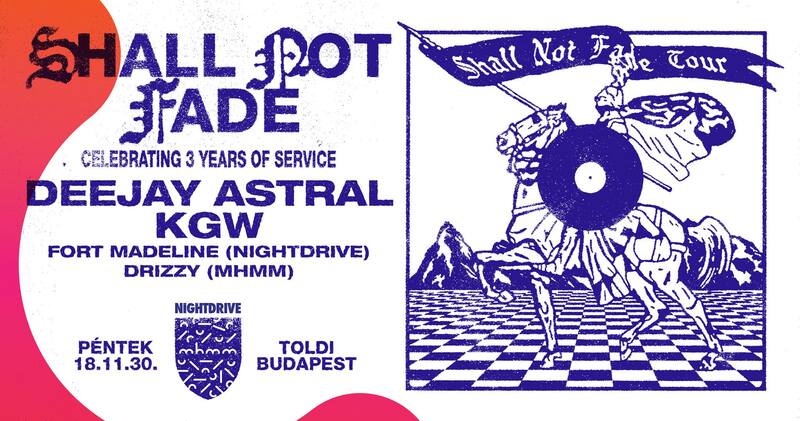 The founder of Shall Not Fade will be bringing us a selection of upcoming material on the label that can be heard rarely elsewhere. With the release of the label's 'Three Years of Service LP' around the corner, we are bound to get freshest of the world that this young man has curated for us over the last years. Lajos, our NIGHTDRIVE co-organiser and musical aficionado under multiple pseudonyms (AIWA, Crisis Sound System, Lil Saggitarius) released an incredible 4-track sample based house EP under the name Fort Madeline with his life-long musical collaborator Kristof in 2014, with whom they also became well known on the local scene as Headshotboyz. Since then we have been waiting for more house from these guys, and luckily on this night we get to hear them wile out. The boy with the sauce. Just trying to push more dank beats and dance tracks. Bringing the usual goodies from the mhmm world. Also incredibly excited to bring together a b2b with the Fort Madeline boys. I've looked up to these guys in the local scene for years now, so this is going to be a lovely wild set to end the party.